Maison Brison, Dorel, and Schwinn, gathered in Boca Raton, Florida (near Miami and Ft. Lauderdale), from across the globe to focus on team building with a Build-A-Bike event. 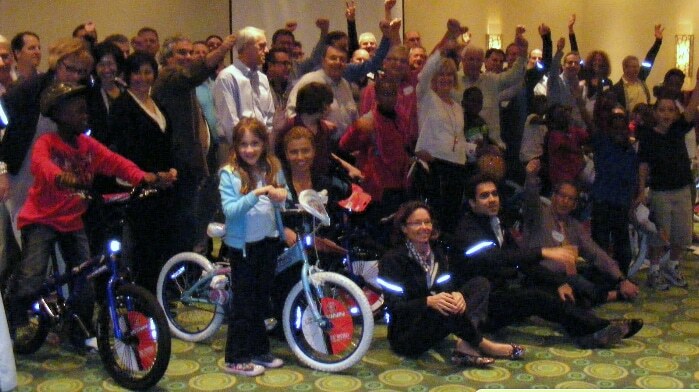 Their goal, not surprising for one of the world’s leading producers of bicycles, was to Build-a-Bike for some kids who had no bikes. From France, Portugal, England, Canada and the US, they came to meet, get to know each other better. They grew from knowing each other through email and phone, to the physical; creating a long-lasting bond and giving back to the local community. As they worked together to cheer on their team they learned about each other’s personality, their strengths, and how to solve problems. The world, suddenly got a lot smaller and easier to navigate. And making travel easier and more fun was the basis for the creation of Schwinn Bikes in 1895 by German-born mechanical engineer Ignaz Schwinn. In 1896 Schwinn entered the bike racing world and won…often. The company has gone through many changes, and is finally part of the Dorel Conglomerate. But the spirit of Schwinn’s creator, who survived all the odds when motorized vehicles began to fill the streets, and of course, the depression, survives and thrives.